If you engage in high intensity exercise on a weekly basis, like Karen and I, you’ll naturally induce muscle damage. This generates inflammation, which can lead to burning, stiffness, and mild to severe pain. If you don’t know what I’m talking about, just think about the last time you did an intense leg workout after taking some time off. Sometimes the soreness can last 4 to 5 days. And the effect worsens with age. Now a typical protocol for most folks is to use anti-inflammatory over-the-counter drugs like ibuprofen (Advil®), but these meds can wreak havoc on your digestive system, your heart, your liver, and your kidneys. But now there is an “all-natural” alternative. The anthocyanins and phenols found in tart cherries have been shown to provide protection against muscle injury and damage. In fact, according to Life-Extension Magazine, tart cherries deliver a high level of protection against cardiovascular disease, metabolic syndrome, and even can fight against Alzheimer’s. And they cite 75 “published” references to back it up. Many of them prove tart cherries and tart cherry beverages speed up recovery time from exercise and reduce inflammatory markers significantly. 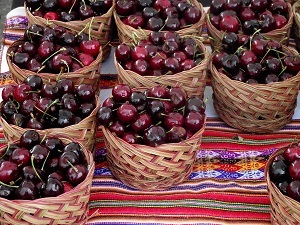 Tart Cherries also contain a hefty dose of naturally occurring melatonin (improves sleep) and they have one of the highest anti-oxidant scores of all fruits and vegetables. Give this shake a try and let us know whatcha think. How does eating tart cherries aid with the fat loss sequence if on the low carb days you advise to NOT intake any fruit sugars or impact carbs? Can you expand a bit on using tart cherries while on the 14 day fat loss sequence plan?